Liittyy aiheisiin illustrating, illustrations, Sketchnoting. Last year I did real-time graphic recording in over 40 events. Most of the events were full-day events, others were two-day long events. So that means I get a lot of practice in fast drawing. However, there are things that I find difficult to draw. A football. Oh my. I’m able to draw a ball, (I really am a pro, yes, I am), but those lines and pentagons in a neat way. Can’t do. A bicycle. Argh! Where are the pedals? Did the bike have some chains, too? Are all the pieces in place? A hand. Luckily I’ve got the model quite close by. Otherwise I’m having troubles in drawing hands in different positions. But I’ve developed methods to survive my troubles. The most important way to make it through is of course practice. For many years I e.g. drew the shaking hands the other way around: I had two left hands shaking! I needed some serious practicing and now I’m able to draw two right hands shaking. Another quick fix is the Adobe Capture CC -app. I’ve created a picture library of my own with a series of images that I either need to draw often or that I find difficult. 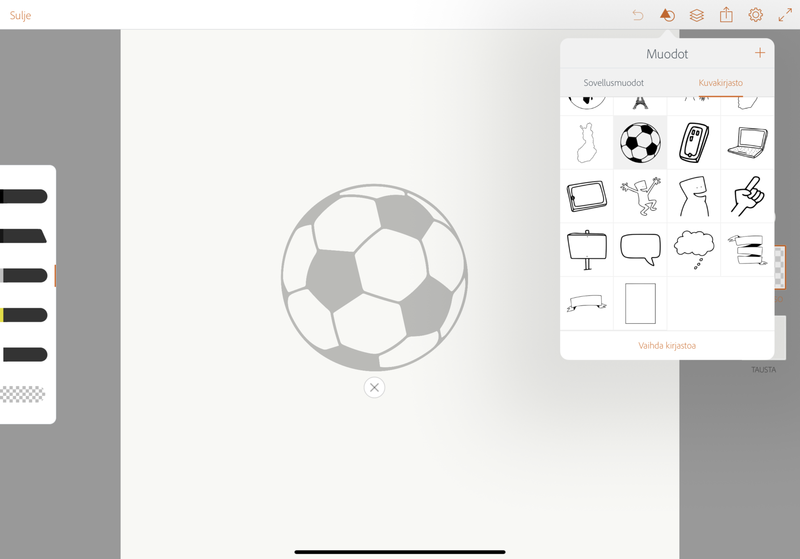 I can quickly search and paste a suitable icon into my drawing that I’m working on with Adobe Illustrator Draw. I also have the basic characters in my library but it’s faster to just draw those. The icons that I use most often are the globe, map of Finland and my own logo. I also have a football in my icon library. Just in case. The third way to survive the agony of not having the drawing skills needed, is Google, every illustrator’s friend. You mustn’t just copy a photograph and draw directly on it, but it helps in most cases when you use Google image search to find how things look like. There are also a bunch of free vector images that you could use but the drawing line is so different compared to mine that I leave them be. 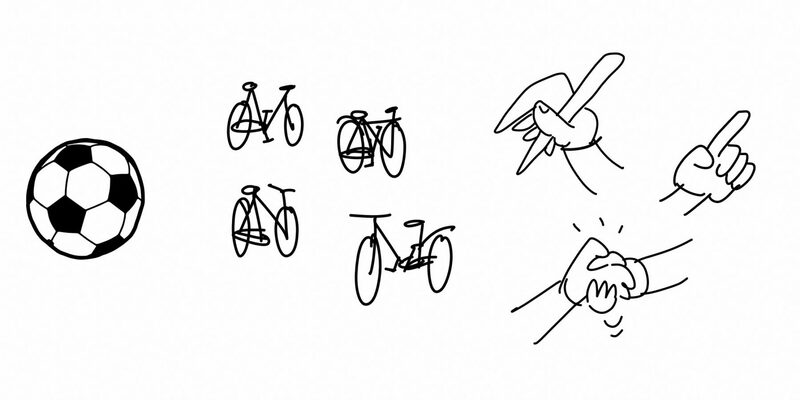 Instead, they’re also good for ideas on how to draw things. But when I’m doing real-time sketchnoting, I don’t have time to google. Then I just have to count on my inner visual vocabulary. Footballs, bikes and hands aren’t the only thing that I find difficult to draw: I’m having troubles with Trump. Basically it’s super easy: just draw fluffy hair and a round, orange face. There, a Trump. But no. I’m having troubles with his face: I feel like he is shifting faces every now and then. There are some expressions that are familiar from photos but I just can’t get the hang of it. He seems to be a man with many faces. When you do a Google image search with ”Trump cartoon” you’ll find the different versions from other illustrators and cartoonists. My version still needs practicing.